a stableman q.v. also in charge of collar room of large cartage stables; issues horse collars to carters (719) q.v. and collects them after the day's work; examines collars for wear and tear and despatches them, as necessary, to saddler's shop for repair. a stable boy q.v., e.g. at racing stables, who takes out horses for exercise. feeds and waters horses in stable; combs and brushes coats, manes and tails; cleans hoofs and applies dressing to hoof fronts; clips horses' coats with clipping machine and trims manes and tails as required; rides or walks horses for exercise when necessary. a groom q.v. engaged in domestic service; accompanies members of family out riding and sometimes instructs them in riding; usually acts as own stableman q.v. and usually is a liveried servant; often waits at table and serves as footman (900) q.v. ; sometimes also assists gardener (013) q.v. in light, work. accustoms young horses to rein and saddle, or to being harnessed to vehicles, and inures them to road traffic; for saddle horses, harnesses in weighted saddle and, using long reins, accustoms horse to obeying words of command, etc., in trotting ring; subsequently rides horse himself until it is perfectly broken in; for vehicle horses, harnesses in light gig with long shafts and drives horse until it is sufficiently used to words of command; completes training in ordinary vehicle and corrects faults, e.g. bucking; cf. rough rider. trims horses' coats, manes and tails, by hand, with a horse clipper as distinct from clipping machines used by stableman q.v. etc. ; usually works on own account or is employed only at large stud, racing, or hunting stables; usually also does work of horse singer q.v. prepares and gives food to horses in large stables; usually done by groom q.v. a groom q.v. skilled in treatment of sick horses; recognises symptoms of commoner maladies and prescribes or mixes appropriate remedies. singes horses' coats after clipping to remove loose ends and promote even growth and glossiness; usually done by horse clipper q.v. a stable helper q.v. employed at livery stables. a stableman q.v. 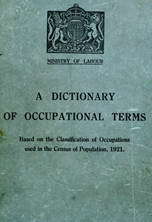 who feeds, waters and stalls customers' horses in hotel stables, and who has custody of vehicles temporarily left in stable yard, coach house or motor garage; collects fees for stabling horses or vehicles, handing to hotel proprietor monies received; often employed part time in driving hotel omnibus to and from railway station or as boots (900) q.v. a horse breaker q.v. who, in addition to other methods of training horses, rides them bare-backed. looks after sick horses, feeds and waters them, and administers medicine; employed, e.g. in large cartage company's stables; work normally done by horse foreman (715) q.v. does odd work in stables, e.g. cleans stables, brings food and water for horses, etc. rakes or sweeps out used bedding, etc., from stable stalls, shovels into barrow, wheels to and tips into manure pit; swills stalls, runnels and stable yard with hose pipe and sweeps down to remove refuse; throws down, with fork, clean bedding (straw, litter, etc.) from loft into stable below and spreads it in stalls; cuts chaff for horses by feeding hand or power-driven chaff-cutting machine; cleans stable windows, sweeps walls and generally cleans stable premises; lime washes stables periodically; sometimes does part of groom's duties, e.g. feeding, watering and cleaning horses.